Coconut Lime Chicken and Rice is perhaps one of the tastiest dairy-free and gluten-free meals I’ve made so far! 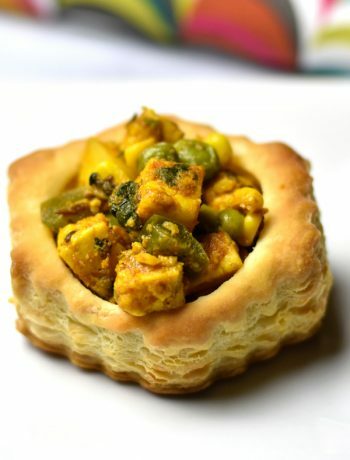 It is unbelievably flavorful, with the tart and tangy lime contrasting the sweet and creamy coconut milk. I marinate the chicken in coconut milk, soy sauce, lime, aromatics and a blend of sweet and savory spices. To infuse the flavors of that marinade deeper, I pressure cook the chicken in the same marinade. The result is moist and tender chicken, that is creamy and delicious. (pressure cooker). With very little effort, I am able to put this one-pot meal on the table, in under 30 minutes. 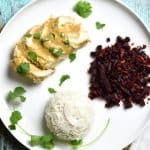 This coconut chicken recipe is so simple and easy to prepare, yet so elegant to serve for dinner. I start by scoring the chicken breast before marinating it. That boosts the marinade flavor in the chicken, even if you skip the marination process. I take a sharp knife and make diagonal incisions on the chicken breast as shown in this picture. Then, I combine the marinade ingredients and throw everything in a ziplock bag (who doesn’t like easy clean-up now!). If you have the time, it’s great to marinate this anywhere from 30 mins to 2 hours. If not, just put everything in the instant pot, chicken and marinade, and the flavors will still be amazing. 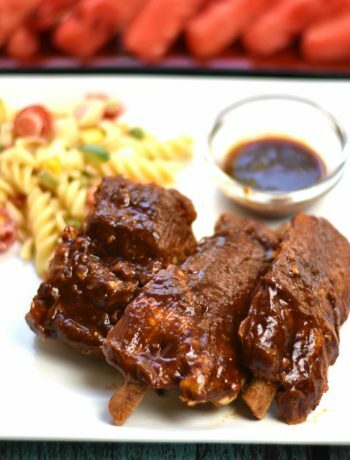 By skipping the marination, you’ll be able to have this meal ready in under 30 minutes, from start to finish too. 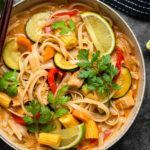 I have made this coconut curry recipe with boneless chicken thighs as well and it turns out pretty good too. You don’t have to score them, just trim off the excess fat. 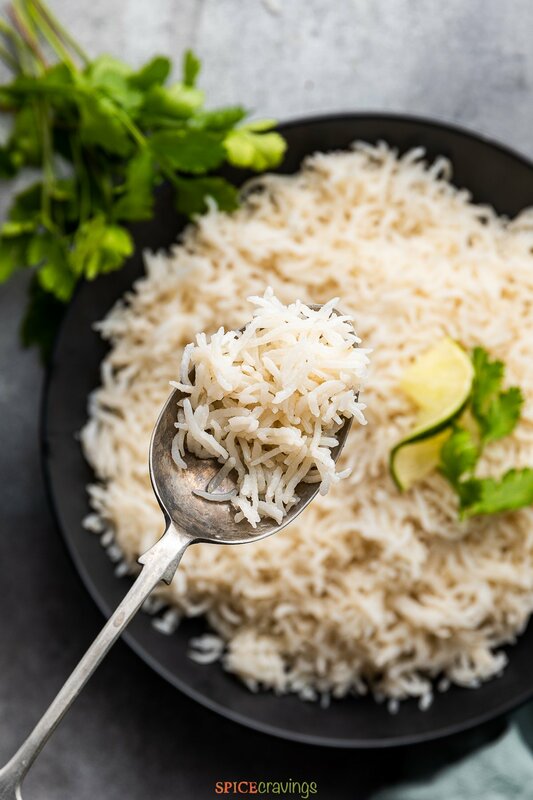 You can cook the Coconut rice using the Pot-in-Pot method in your Instant Pot (see FAQ on instant pot to learn more). Simply rinse the rice 2-3 times and if you have the time, soak them for 15-20 minutes. Take an oven safe bowl or insert, and add rice, coconut milk and salt. Add chicken and marinade, place a trivet in the pot and place the rice container on top of that. Now, set a cook time for 6 minutes at high pressure, and you’re done! You can cook the rice separately too. Follow your preferred stove-top, or microwave recipe for making rice, and replace the water with coconut milk. I like to serve this coconut curry chicken dish with a side of vegetables. You can serve it with a salad too. As for sides, you can pick any sides that you like, like green beans, carrots, or, peas and corn. I serve this meal with a side of Beet Coconut Stir Fry. Yup! turns out too much of coconut is a good thing for me. I simply saute the chopped beets with some coconut oil or olive oil, mustard seeds, coconut flakes, salt and some Indian spices. It takes only 4-6 minutes to make this delicious side. When it’s hot, add the chicken along with the marinade. When the mixture begins to bubble, reduce the heat to medium heat, cover it, and cook it for around 10-15 minutes, or until the chicken cooks through. Remove the chicken and keep aside. Continue to cook the sauce, uncovered, and reduce it to your desired consistency. Meanwhile, in another pot, cook the rinsed and drained rice as per your preferred recipe, and simply replace the water with coconut milk. Adding a dash of salt, balances the creaminess of coconut milk really well. Sometimes, I like to grill this chicken, or broil it, to use it in sandwiches and salads. The grilled exterior adds a beautiful contrast to the creamy coconut flavors inside the chicken. To broil this in the oven, I line a baking sheet with aluminum foil. Then, I drain the chicken and place it on the lined sheet. I cook it under the broiler for 6-8 minutes per side, flipping half way through. The cook time may vary depending on the thickness of the chicken breast and oven temperatures. If I’m using chicken thighs, I cook it for 6 minutes on the first side and 4 on the other. That simple! I follow the same cooking time when I am grilling it on an outdoor grill. Coconut Lime Chicken and Rice is perhaps one of the tastiest dairy-free and gluten-free meals I've made so far! 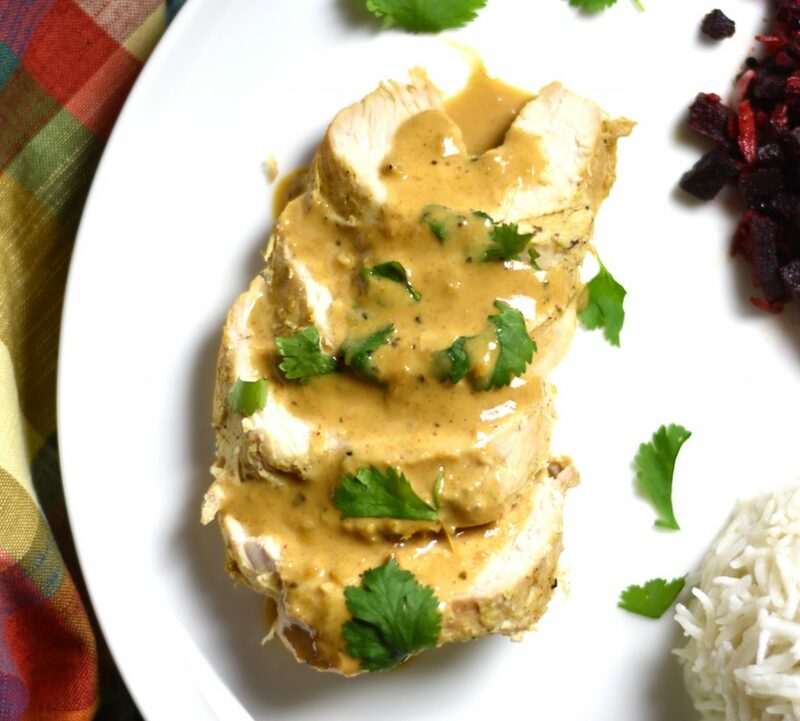 I marinate the chicken in coconut milk, soy sauce, lime, and a blend of sweet & savory spices. I pressure cook it in the same marinade. To make this one-pot meal, I cook rice in coconut milk in the same instant pot. Prepare marinade by combining all ingredients listed under "marinade for chicken". I do this step in a gallon size ziplock bag for easy clean-up. Score chicken breast and add in the bag. Close the ziplock and coat the chicken well with the marinade. Refrigerate this for 30 minutes to 2 hours. If you're short on time, skip the marination wait time and proceed to cooking. Assemble the rice. Rinse Basmati, Jasmine or any long grain rice 2-3 times till water runs clear. Soak for 20 minutes if you have time. Combine rice, coconut milk, water and salt in a small pot that you can place on the trivet. Alternatively, you can cook this separately in another instant pot. Turn Instant Pot on (see Instant Pot FAQ). Pour in the chicken and marinade in the inner pot. Place the trivet. Place the pot with the rice and coconut milk on top of the trivet. Close the lid. Valve set to sealing mode. Cook at Manual or Pressure Cook (High) for 6 minutes. Let the pressure release naturally for 10 minutes before opening the pot (NPR 10). Open lid. Fluff rice with a fork. Remove chicken breast and rest them for 5-7 mins before slicing. You can thicken the sauce in the inner pot on SAUTE mode for 2 minutes or so. This step is optional. That's it- you're done. 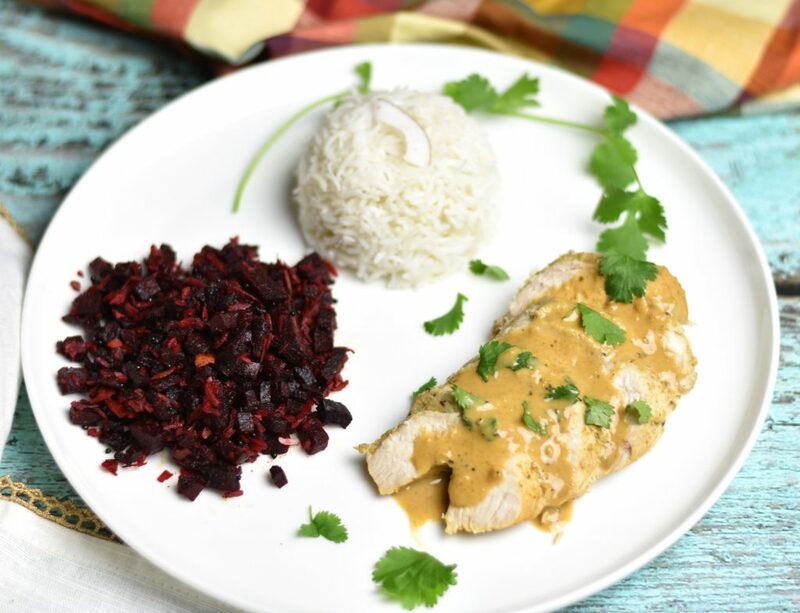 Serve some sauce over the sliced chicken and serve it with the warm coconut rice. Yum! Heat a heavy bottom pan on medium-high heat. When it’s hot, add the chicken along with the marinade. When the mixture begins to bubble, reduce the heat to medium heat, cover it, and cook it for around 10-15 minutes, or until the chicken cooks through. Is the coconut milk canned or in a carton? Hi Kathleen, I use canned coconut milk. I like a brand called ‘chaokoh’. It’s very creamy, which adds to the flavor of this dish. Hope you enjoy this chicken! I have tried to find the re iOS for coconut beets but no luck. Is it still to be done? Thank you Aneeshasg, the chicken was delicious. Awesome! So glad you enjoyed the chicken. I’m sure you’ll enjoy the beets too. Thanks for sharing your experience! 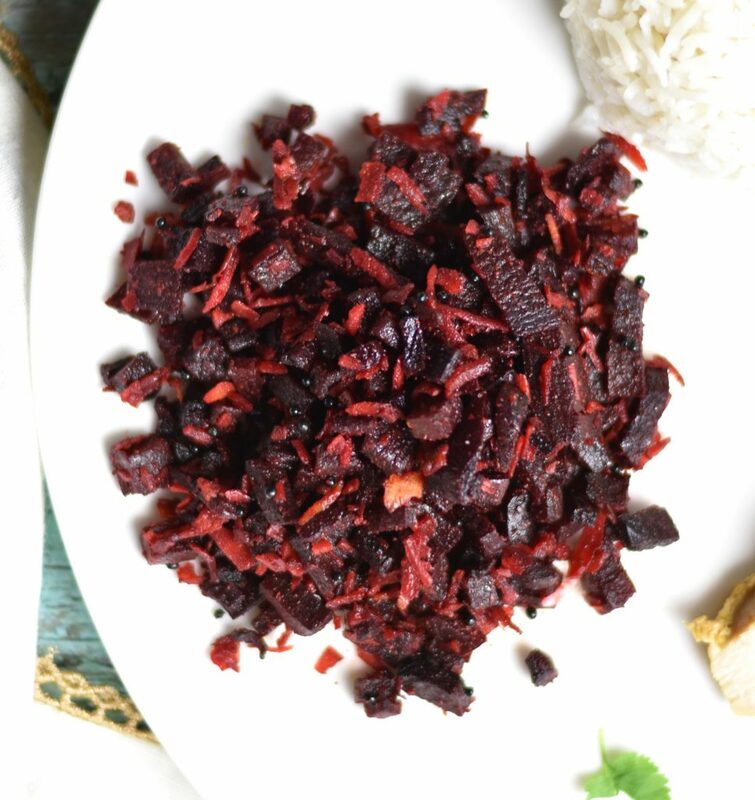 Hi Jennifer, I’ve updated the recipe for Beet Coconut Stir Fry! Sorry it took long, but hopefully you’ll love the taste!